Girls 13u Aces Take GOLD at Provincials!!!!! After finishing in the top 30 out of 78 teams at the 14u Provincials, landing them in Division 1 on April 1-3rd, the 13u Girls Durham Attack Aces went into the 13u Provincials excited and eager to build from that experience and represent Durham Attack in the best way that they could, and focused their efforts on achieving Gold in Tier 1, making them the 13u Ontario Champions. Being ranked 3rd out of 38 teams, the girls got ready for tough competition throughout the weekend. On Saturday, they were undefeated, but worked hard for their wins. The first game at 8am put them against Hamilton MVC and they won, 25-8, then 25-11. In Match 2, the Aces faced Oakville Thunder White and won both sets 25-16, 25-10. The toughest competition that day was when our Aces had to face Durham Attack Knack, and after some great rallies the Aces won with scores of 25-19, then 25-10. Great Job Coach Linda and D.A. Knack!!!! Day 1 finished with a rainy barbeque at the hotel, swim time, and a lot of laughs for everyone. Day 2 presented more challenges as they went into the crossovers and faced Durham Attack T.A.B.U. – the club’s youngest team. This team handed the Aces their first loss by taking the first set 17-25. In the second set, the Aces woke up and won 25-16. In the tie breaker set, the Aces fought back from a 9-12 deficit to take the match 16-14. Great Job Coach Carol and D.A. T.A.B.U.!!! The Aces had to play against Niagara Rapids Black, a very strong team. All twelve of our girls brought their “A” game and won both sets with 25-19, and 26-24. It may have helped that all the parents in the stands were praying to not go to a tie breaker game; apparently the players handled the stress significantly better than the parents. Great Job and Congratulations to Abby R, Breanna G, Brittany M, Deanna N, Emily A, Emma A, Giselle E (Team Captain), Julia B, Lillianna H, Madison J, Sierra S and Stephanie A for a well deserved Gold Medal and earning the title, Girls 13 and Under Ontario Champions 2011! And a very special Thank-you to the Coach, Chris Dunn for a very successful season. His dedication to the team dynamic along with skills development has made 12 girls and their families very eager to continue to strive to be the best volleyball players that they can become. The Durham Attack Aces 13U Girls team has had an excellent start to the 2010 – 2011 volleyball season with 3 tournaments and 3 medals!!!! The first tournament that the girls played together was a 13U invitational tournament hosted by the Stouffville Stingers on November 13, 2010. It started out kind of rocky, but finished very well!!! The girls had a slow start and came through in the end to win a couple of hard fought games to take Gold! Great job Girls!!!! 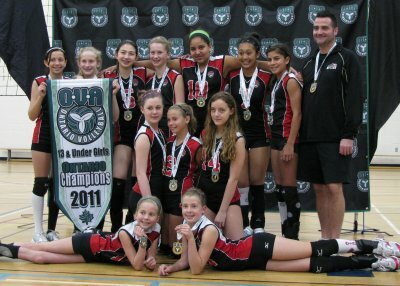 In their second tournament, an invitational hosted by DRVC 14U on December 5th, 2010 Durham Attack Aces won the Bronze Medal! Another great result for our 13U girls. All the girls played very well in this tournament. They came up against some very tough competition from Durham Attack 14U Black, DRVC 14U and the Scarborough Titans. The most recent tournament, the team won the Silver Medal in their first 13U OVA tournament, which was their first experience with the triple ball format. They got off to a rocky start, however still won against the Markham Stingers. Next they battled and won against the Barrie Elites making them first in their pool. With a 2 match break and thanks to the parents, the girls enjoyed a hearty lunch, including a fantastic barbeque, and then they moved on to the crossovers. In the final Gold Medal match, the Aces came up against an experienced and strong Scarborough Titans team. The Titans won the first game with 25-16. The Aces fought back winning the second game 25-23, but were defeated in the tie breaker match 15-11.
Credit goes out to coach Chris Dunn for doing a great job preparing the team for the tournament and skillfully managing the games and also to Paul Jenkins for assisting with the Triple Ball Toss in. Recognition must also go out to the parent cheerleaders who provided some very enthusiastic motivation from the stands!!! !